One important element of any aquarium is the aquarium rocks and caves that are used and included in the underwater landscape. Caves offer your fish hiding places, and reduce the stress they experience. Both saltwater and freshwater fish will require caves and rocks, and you should also include some plants, and even acrylic aquarium decorations as well. Rocks are used to give the aquarium structure, and improve the appeal of the tank for the inhabitants and those who view it at the same time. Aquarium rocks and caves can come in a wide range of colors, styles, sizes, and shapes, and all rocks except for the live rock varieties used in saltwater tanks must be thoroughly cleaned before being used. Rocks for the aquarium can range from smaller than a pea to larger than a piece of bread or even bigger, and they can normally be found at any pet store that offers freshwater and saltwater aquarium supplies. Gravel is the smaller aquarium rocks that are used to cover the bottom of the tank. 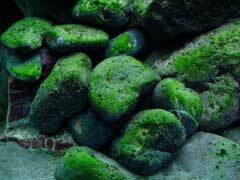 River rocks are larger, and are frequently stacked to build caves and other hiding spots on top of the gravel. Slate is another type of rock that works very well in almost all aquariums. Lava rocks should be avoided if possible, because there are sharp edges which could damage the fish and may cause problems with some aquarium filters if smaller pieces break off. Synthetic aquarium rocks are another choice, and these cost more but will never affect the chemistry of the water. These rocks come in a wide range of shapes, and caves can be purchased already constructed from this material or there are snap together elements that allow you to create a custom cave for your aquarium. Rocks and caves make terrific fish tank decorations, and they also help minimize the stress of the fish and other inhabitants. Gravel and rocks on the bottom also prevent the fish from becoming confused about where the top of the tank is.